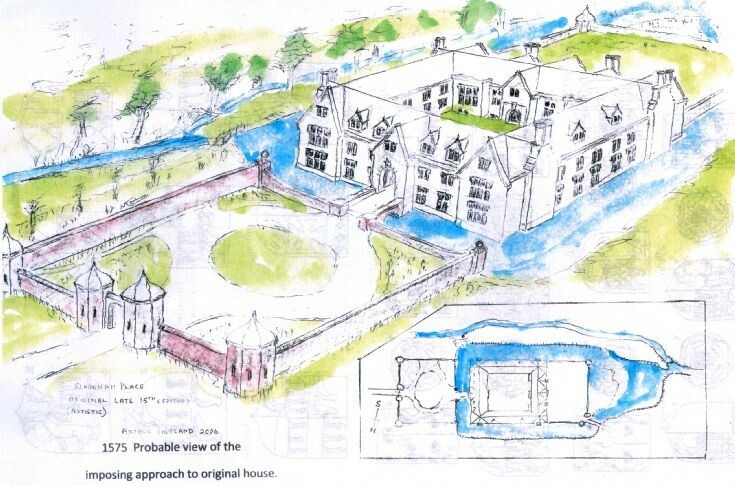 Seen here is my conjectural reconstruction of Slaugham Place as it may have looked in 1575 with the original moat. The gardens were extended a few years later and much of the moat was filled in. To view a drawing of what the mansion may have looked like in 1600 click on Large Version. I wondered what sort of community existed in the 11th century when the original church was built in Slaugham. My musings on this, the history of Slaugham Place, and notes on the iron industry can be viewed by clicking on Open Document. Thank you Arthur! Love this!! Although I have never been there, I have been researching Slaugham Place, home of my Covert "greats" for many years. Reading your paper on the Establishment of Slaugham Place. Well done! Yes, the Coverts were originally from Normandy. I am planning a visit to England in the near future. If you have additional information you would like to share regarding the Covert lineage, I will be ever most grateful. I've lived less than a mile from the ruins for 43 years. Some 40 years ago I discovered a shaped side to a door or window obviously from your site in my stream next to Mallions Lane which was a significant but tricky local route in the 18th century. Should you like to see it or/and get it back, please get in touch through peterchip@uwclub.net or 01444 400734. Always up for a salvage barter.